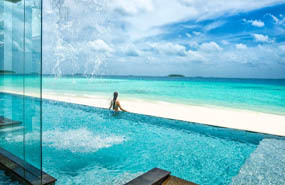 Four Seasons is represented in the Maldives in two resorts, Landaa Giraavaru and Kuda Huraa, together with a luxury tri-deck catamaran, the Four Seasons Explorer. So there’s really no need to choose shore or sea when it’s effortless to share your holiday between them. Styled after a Maldivian village, this picture-perfect resort on the coral island of Kuda Huraa combines the escapist nature of the Maldives with the legendary standards of Four Seasons. 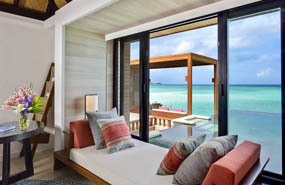 It comprises 96 privately tranquil accommodations: pavilions and bungalows along the white sand beach, and new all-pool villas over the crystal lagoon. 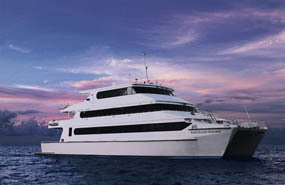 Climb aboard the Four Seasons Explorer and you’ll find a PADI Dive Centre and an on-board spa so you lose none of the amenities while gaining an intimate resort experience. Just 22 guests sail on the catamaran, enjoying a minimum of three dives a day as well as the option to snorkel, water-ski, fish, kayak, visit secluded islands or relax over gourmet meals and sandbank barbecues. including Etihad Coral Class flights, transfers and access to the airport lounge on departure from London.